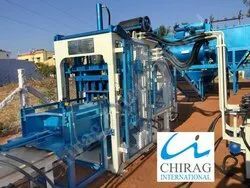 Pioneers in the industry, we offer automatic cement brick machine, fully automatic hydraulic paver block making machine, hydraulic paver block making machine, multi-function hydraulic paver block making machine, semi-automatic hydraulic paver block making machine and chirag multi material hydraulic paver block making machine from India. 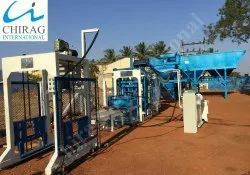 We have created a unique niche in the domain of manufacturing and supplying quality assured range of Cement Brick Machine. 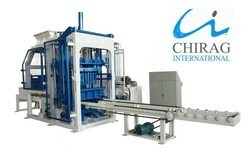 These machines are made using high grade material & components and in compliance with the industry standards. Our clients can further avail these machines from us at economical prices and within the stipulated time period. Main Features: Uses Delta PLC control system and Delta Touch Screen.A. Visualization screen with easy operation;B. Is able to set up, update and amend the production perimeters, to maximize the production output;C. Dynamic display of the system status, automatic trouble shooting and warning notice;D. Has automatic-locking function, avoiding mechanical accidents caused by operational mistakes;E. Is able to troubleshoot the machinery via tele service. Uses high dynamic proportional and directional valves, which automatically adjust the oil flow and pressure as per specific working requirements to buffer the hydraulic cylinder when working; uses integrated high pressure and soft oil pipes, with easy installation; Uses 360 multi shaft rotating and compulsory feeding, which greatly improves the density and intensity of the blocks, and reduces the feeding time as well; Integrated structure of vibrating and moulding platforms, which reduces the weight of the machine, an improves the vibrating efficiency; Four rods guiding system and high-precision long guide bushing are used to assure the precise movement between the tamper head and the mould; Heavy duty machine frame which uses high density steel and advanced welding technology is vibration proof. Main Features:Uses Delta PLC control system and Delta Touch Screen.A. Visualization screen with easy operation;B. Is able to set up, update and amend the production perimeters, to maximize the production output;C. Dynamic display of the system status, automatic trouble shooting and warning notice;D. Has automatic-locking function, avoiding mechanical accidents caused by operational mistakes;E. Is able to troubleshoot the machinery via tele service. Uses high dynamic proportional and directional valves, which automatically adjust the oil flow and pressure as per specific working requirements to buffer the hydraulic cylinder when working; uses integrated high pressure and soft oil pipes, with easy installation; Uses 360 multi shaft rotating and compulsory feeding, which greatly improves the density and intensity of the blocks, and reduces the feeding time as well; Integrated structure of vibrating and moulding platforms, which reduces the weight of the machine, an improves the vibrating efficiency; Four rods guiding system and high-precision long guide bushing are used to assure the precise movement between the tamper head and the mould; Heavy duty machine frame which uses high density steel and advanced welding technology is vibration proof. Main Features:Ø Uses Delta PLC control system and Delta Touch Screen.A. Visualization screen with easy operation;B. Is able to set up, update and amend the production perimeters, to maximize the production output;C. Dynamic display of the system status, automatic trouble shooting and warning notice;D. Has automatic-locking function, avoiding mechanical accidents caused by operational mistakes;E. Is able to troubleshoot the machinery via tele service.Ø Uses high dynamic proportional and directional valves, which automatically adjust the oil flow and pressure as per specific working requirements to buffer the hydraulic cylinder when working; uses integrated high pressure and soft oil pipes, with easy installation;Ø Uses 360 multi shaft rotating and compulsory feeding, which greatly improves the density and intensity of the blocks, and reduces the feeding time as well;Ø Integrated structure of vibrating and moulding platforms, which reduces the weight of the machine, an improves the vibrating efficiency;Ø Four rods guiding system and high-precision long guide bushing are used to assure the precise movement between the tamper head and the mould;Ø Heavy duty machine frame which uses high density steel and advanced welding technology is vibration proof. 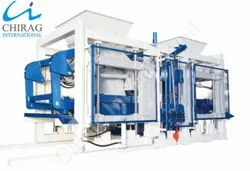 We are engaged in offering a wide range of Chirag New Generation Hydraulic Paver Block Making Machine( This machine is Multifunctional, Could make all kinds of Blocks,Bricks and Pavers while change the moulds.) Simple structure; small occupying area; stable and reliable function and convenient maintaining; Simple manual operation enables the workers to learn fast; This machine combines many functions into one with low consumption. It is adopting with multi-valves in series, electricity discharging unit and compressing and vibrating organic combing unit to materialize the highest molding and density of the finished products.Chirag New Generation Hydraulic Paver Block Making Machine Auto pallets conveying, pallets feeding and compulsive materials arranging have highly raised up the production efficiency and reduced the working intensity, while simple pallet conveying and feeding units can be installed for production. 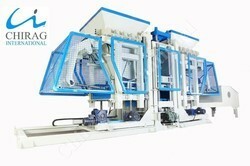 Looking for “Hydraulic Paver Block Making Machine”?